We took off to Baltimore this past weekend. 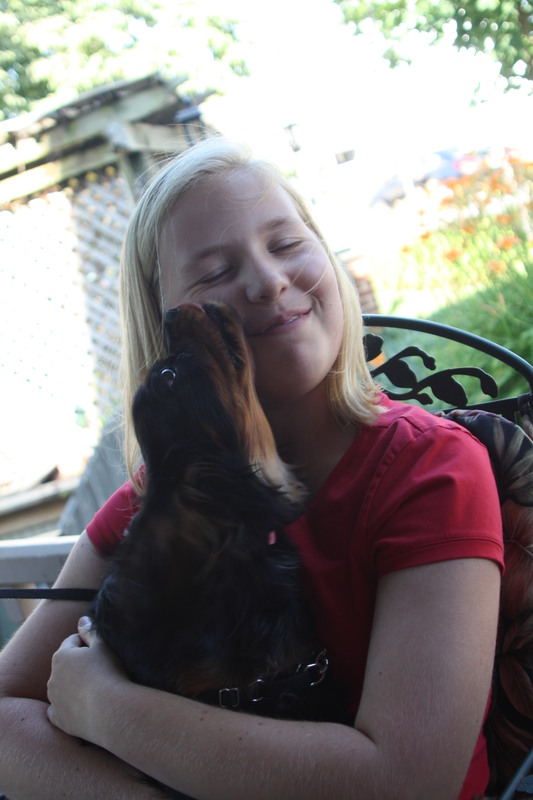 Generally I’m not so hot at making time to visit with anyone outside of the particular branch of the family tree we are staying with, but one of the beauties of summer is that we have enough wiggle room in our schedule to have long weekends. Which means being able to make time to see people we really want to see. In this case, it was Pete & Renee, friends of my parents. We had lunch with them on Saturday, giving Renee an excuse to get crabs. 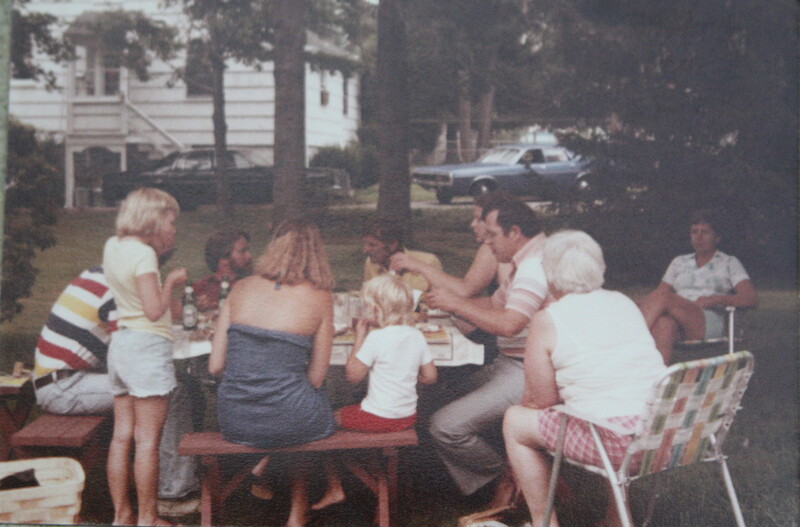 Summer at Granny & Granddad’s, late 1970’s. Picking crabs is a very enjoyable way to spend a Saturday afternoon, quite possibly one of my all time favorite ways. Sure, they are messy, smelly and a hell of a lot of work for what seems like very little food. 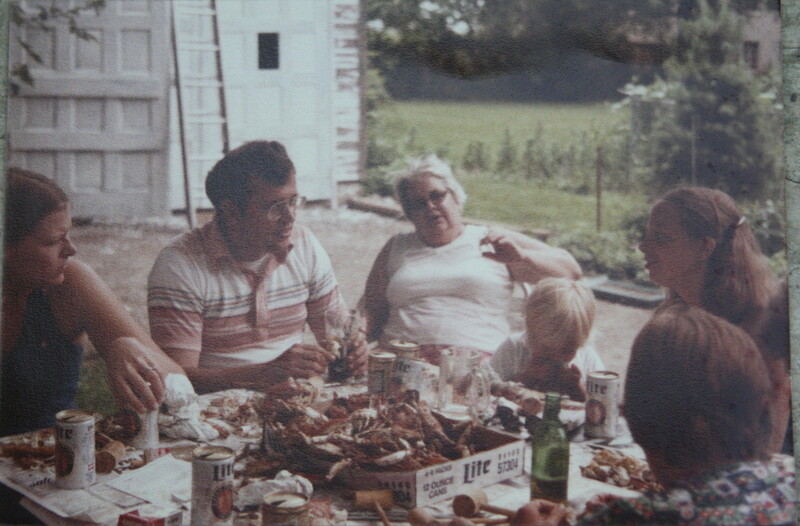 But there is nothing more delightful than sitting around a picnic table with ice cold drinks, a few dozen crabs and some good company to while away a summer afternoon. 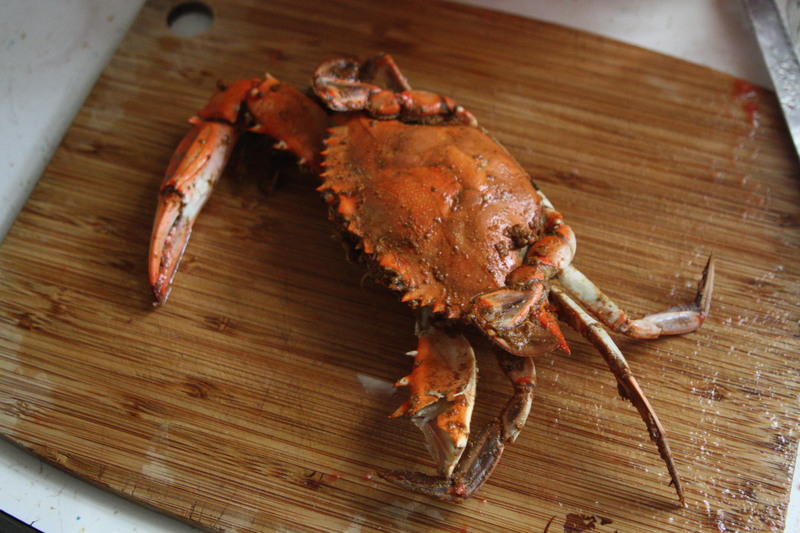 For my readers not familiar with the Maryland style of crab picking, Chesapeake Bay blue crabs are loaded live into a steamer pot that has a blend of water, apple cider vinegar and sometimes beer. 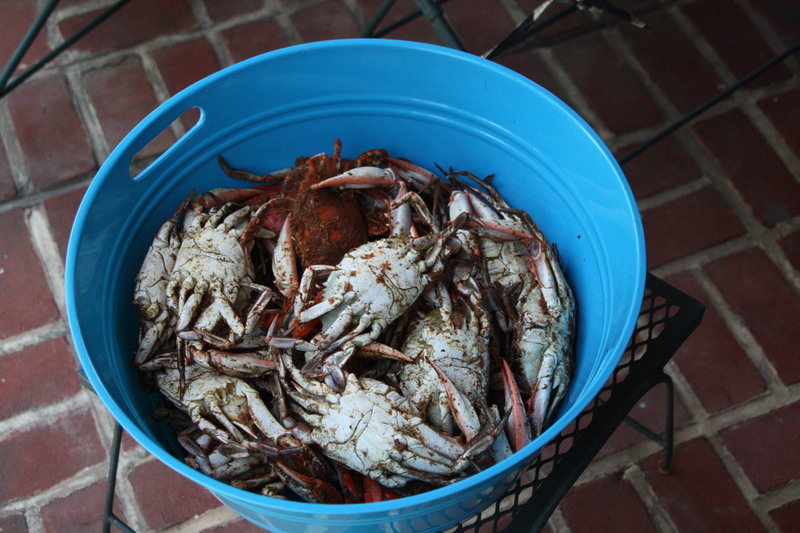 As you pile the crabs into the pot, sprinkle each layer with a generous coating of Old Bay seasoning and kosher salt. 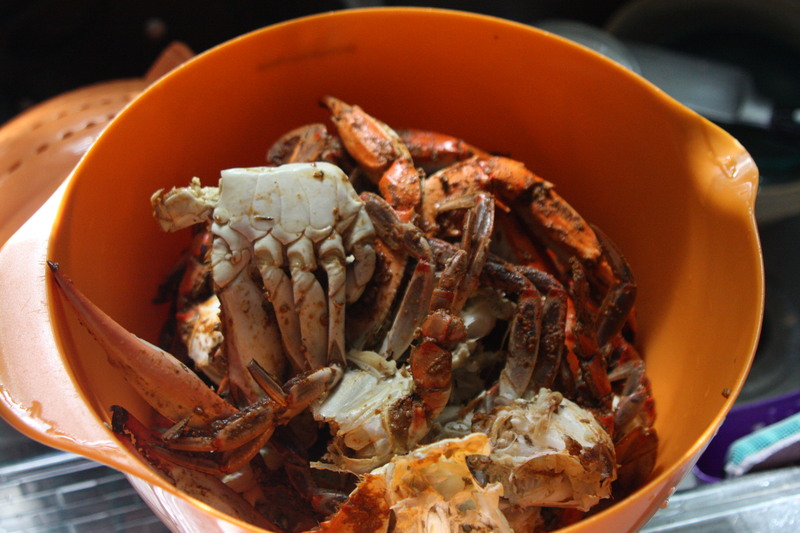 The crabs will turn orange when fully cooked. You’ll want to serve them outside, on newspaper, so that clean up consists of rolling up the tablecloth and disposing. A roll of paper towels is recommended, although in a pinch, you could just have the sweetest, cutest puppy around lick your face clean. Renee insisted on sending us home with a cooler full of leftover crabs. While we nibbled on them for dinner that night, a good dozen found themselves coming home with us Sunday. I realized the only thing left to do with them was to make crab soup. My recipe is loosely based on what I vaguely remember my Granny doing after a crab fest in her back yard during my childhood. Once you’ve had your fill of crab, you sit and pick a few more for the meat. Put that meat in a bowl. Of course, part of the reason you’ve had your fill is because you’re tired of picking. Which means you take the lazy way out of putting those leftover crabs in your soup. You take those beautifully steamed hard shell crabs and peel the back off, pull out the mustard, lungs & other innards, crack them in half and throw them in a bowl. You take that bowl and throw it into what would otherwise be a pot of vegetable soup. I’m not sure where I got the idea that you should use a beef stock with this soup – I can remember my mother using it, but I’m not sure if it was her spin on her mother’s soup or the way her mother made it. 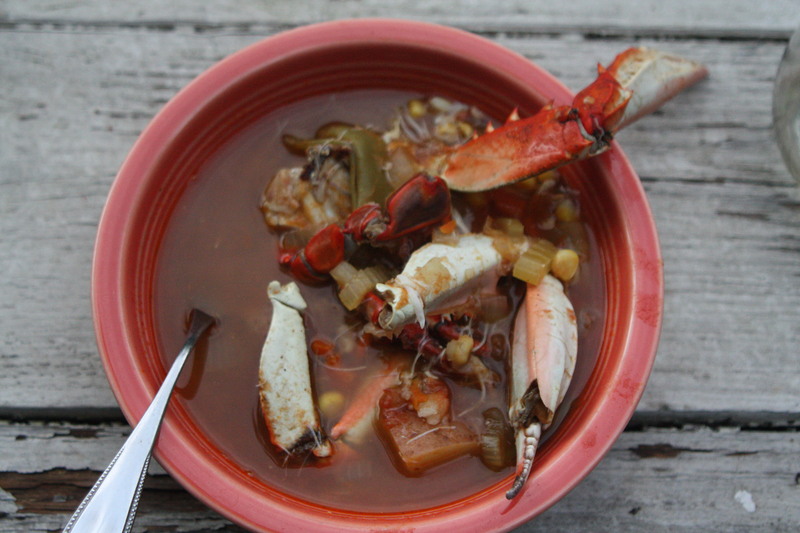 Either way, my crab soup recipe is based on what I remember growing up with. A tomato based vegetable soup with beef broth, corn, beans & potatoes. 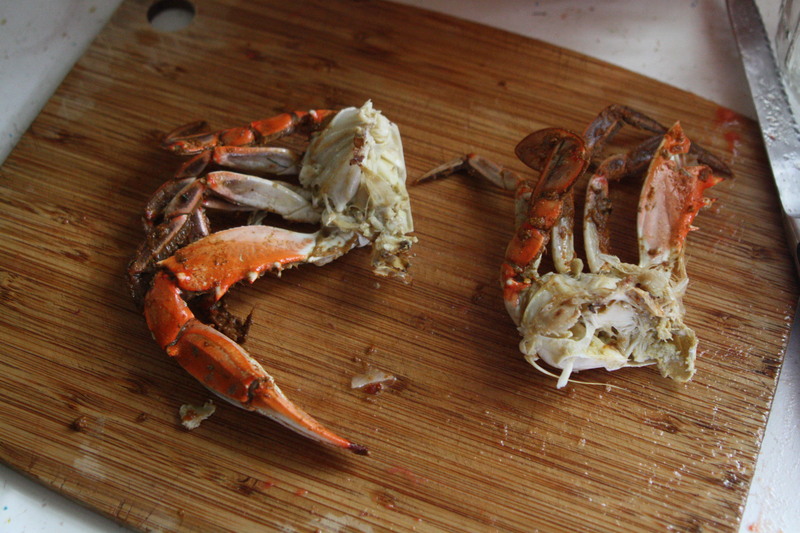 When you throw the leftover crabs in, you also add all the spice left on their shells from the steaming process, which means you barely need to season the soup at all. 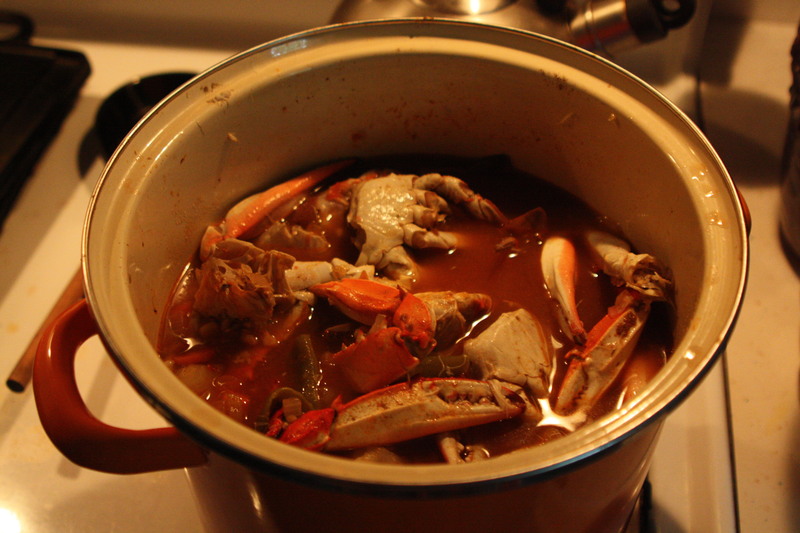 You can make this soup with picked crab, just remember to add a few teaspoons of Old Bay to season properly. When you serve the soup, you’ll want to have extra plates on the table to hold the crabs that get pulled out of the soup as it is eaten. You’ll also want a bowl to hold the discarded shells. During the summer, this soup gets served outside on the picnic table, but in a trick I learned from my Granny, you put a few quarts of this in the freezer, to be pulled out some cold winter’s night when you need a taste of summer. Saute chopped onions, garlic, carrots and celery in olive oil. Add one large can chopped tomatoes, 2-3 cups of beef broth and/or water, some chopped potatoes, pinch of salt. Bring to a boil. Add frozen (or fresh!) corn, green beans, sprinkle of Old Bay. Cook about 10 minutes, then add picked crabmeat and crabs, fresh parsley. Continue to simmer about another 10-15 minutes. Serve with lots of paper towels and crusty bread to soak up the broth. Picking crabs with friends and family=good times! Instead of a traditional July 4th cookout this weekend, we’ve decided to host a low country boil…and yay, the weekend starts in just a few hours; going to kick it off with beer and wine tasting tonight at our favorite go to place for grown up beverages! Ha! For years my daughter wouldn’t touch crabs because she once witnessed a soft shell trying to escape the frying pan. Being raised inland, there were not boils of any kind in my youth. I don’t recall attending a boil until I was in my 20’s, and that was Beam’s Crawfish Boil in Birmingham (which after the crash and burn at Healthsouth is no longer put on). Looking at your pictures sure does make me want to pick up some crawfish or shrimp and put on my “Pinch Me, Peel Me, Eat Me” t-shirt though! I miss the old crawfish boil, but that was getting a little too big when we were still there. I discovered OT’s fried green tomato sandwiches at that event! Your crab soup looks amazing! What a delicious and efficient way to use up the crab. And I love the pre-Instagram-era pictures you’ve put in here from the 70s alongside current ones. Great idea. Looks like a good weekend. It’s what my Granny did, so I don’t know anything different!